Nicknamed “the mother of all bombs”, the GBU-43 Massive Ordnance Air Blast bomb was dropped last Thursday from an American MC-130 aircraft in the Achin district of Nangarhar province, bordering Pakistan. Since then questions have surrounded the decision to use the weapon, which is one of the largest conventional bombs ever used in combat by the U.S. military. The strike drew condemnation from some prominent figures, including former Afghan president Hamid Karzai and Afghanistan’s ambassador to Pakistan. Echoing initial estimates, Salvin said the U.S. military has “high confidence” that no civilians were harmed. “We were and we are kept in the dark and still we haven’t been able to go to the site,” said one senior Afghan security official, who declined to be named because of the sensitivity of the issue. In meetings of the Afghan security council, some ministers told President Ashraf Ghani they feared the lack of information from the U.S. side could be exploited by Islamic State, which has continued radio broadcasts claiming none of its fighters were killed. Salvin would not comment on claims by Afghan defense officials that nearly 100 Islamic State fighters died in the strike. The attack was aimed at destroying an “extensive” complex of fortified tunnels and mines and not any particularly large concentration of fighters, he said. “Our assessments are ongoing,” Salvin said, noting that the strike appeared to have collapsed many tunnels, destroyed mines, and “reduced” several nearby structures. U.S. troops have continued to use explosives to collapse other tunnel entrances not destroyed by the bomb, he said. For at least a month before the strike, the U.S. military had broadcast radio messages warning of coming operations by American and Afghan troops in southern Nangarhar, and leaflets were dropped on areas affected by the operation, Salvin said. Several villages near the blast site have been largely abandoned for months as fighting increased between Islamic State and the U.S.-backed Afghan forces, locals said. “There were daily bombings and fighting,” said Khan Afzal, a local policeman on a recent patrol in the village of Abdul Khil, less than a mile from the strike. “Afghan forces used to fire artillery, bombs were dropped by foreign aircraft, and even Daesh fired rockets at us and at the villagers,” he added, using an Arabic term for Islamic State. Residents in Achin district say that they knew of no civilians still living voluntarily in the areas near the Islamic State stronghold, but it is still not clear if other non-combatants may have been involved. Some local residents suggested there may have been prisoners held in the tunnel complex, she added, but the area has been something of an information black hole since Islamic State militants were first confirmed there in 2015. 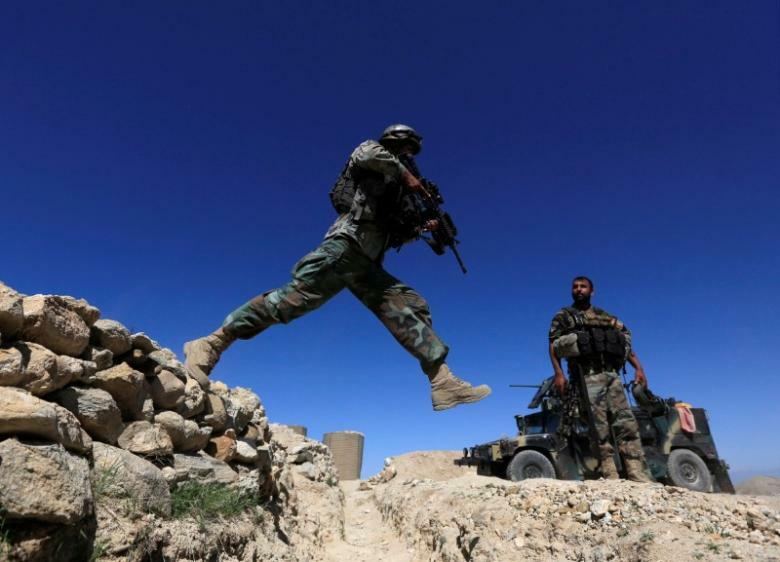 The Afghan offshoot of the Middle East-based, extremist militant movement is small – presumed to number a few hundred fighters – and is battling foreign and government troops as well as rival insurgent groups, most notably the dominant Taliban. U.S. Troops Still Battling Islamic State near Site of Afghan Bomb Strike. Afghan officials complained of lack of information about the effects of the bomb.